“I can’t even begin to describe how amazing the trip to South Georgia was. Probably one of the highlights of my life, if not the best ever trip I’ve ever done in my life. It was life changing. I have never been in so much awe landing on its beaches every day, seeing the magnitude of wildlife all around us. I couldn’t stop pinching myself, feeling like I was in the middle of a Planet Earth Animal Planet documentary. Everything from the king penguins to the adorable seal pup weaners to the huge variety of birdlife, I was speechless so many times. Because of your thoroughness and my research, I was prepared for the logistics of it my voyage. I was not prepared for the choked-up feelings I would have throughout the journey, being able to land in such wild places so quietly and then wend my way among wild creatures, to become a part of the natural landscape myself. 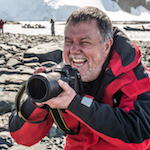 Faced with such unexpectedly close contact with penguins, seals and seabirds, my camera was busy, busy, busy – and then I would put the camera away and luxuriate in just being there – the huge privilege of just being in the wilderness, surrounded by species that paid me no mind. It was as though I had become a part of the overall landscape. I could go on, but you know all this yourself – and I am grateful for having been under the guidance of your great expedition staff while on board the Akadmik Ioffe, in transit via the zodiacs, and at the landing sites. The Northwest Passage is a “journey” and passengers should be very aware the route is subject to change at ANY time (sometimes the plan for the afternoon was changed by lunch!). However, this added, NOT detracted, from the feeling of being on an expedition, not a “cruise” — and in our case, the changing sea ice allowed us extra time viewing polar bears. Never in our lives have we felt so “not of this planet” as we did while on this voyage. It wasn’t just the absence of TV, internet, and email (although that was a nice benefit! ), it was the total absence of all things familiar…like being dropped into a void. The ship is comfortable in a “functional” way…everything you need, and nothing you don’t…all focus is on the experience. The Northwest Passage is a great “hybrid” voyage: mammals, birds, general nature observation, history, culture, and mind-boggling photography opportunities. The expedition staff is what makes the ship “home” – they provided focused attention to each of the 94 passengers – determining specific interests and then, when possible, highlighting specific sighting or observations. I cannot overstate what a smart, enthusiastic, AND funny bunch they were — and yet, they never lost sight of their primary mission, ensuring passengers safely enjoyed the adventure – and in Arctic waters, with polar bears on the prowl, this cannot be overstated! We all had the best trip. 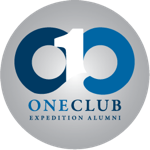 One Ocean Expeditions is an amazing company. I should have known from the careful attention you always give us, but the staff makes a great trip just incredible. The wildlife sightings, especially at South Georgia were once in a lifetime. The crew was attentive. But the staff made all the difference. They knew us and our names mostly by the second day. They looked after my parents so carefully. We would highly recommend you, your company, and this trip to anyone. I just wanted to say a big thank you following the wonderful holiday I took this year on board the Academik Sergey Vavilov to the Arctic (Voyage to Spitsbergen Encounter, 10 days on 14th July 2016). 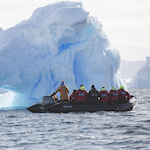 I had a fantastic time from start to finish; I loved the ship and the staff were great – doing everything they could to allow us all to see as much as possible of the wildlife and beautiful scenery, sharing their expertise along the way. I was travelling alone but didn’t feel alone from the moment I stepped on board, everyone was so friendly and keen to share their experiences, and the days/evenings were action packed with zodiac trips, talks, and catching up in the bar! The ship gave me that real expedition feel and the open bridge policy I particularly loved as it really is special getting the same view as the captain and seeing him manoeuvre the ship. I also particularly loved the good viewing from the Vavilov as you have easy access and can get right the way around the ship – something I usually look for – essential when tracking that polar bear! I would definitely recommend a trip on board. 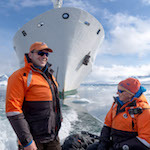 I have just returned from your Svalbard expedition/voyage (13-22 June) and I wanted to take a minute to write to you personally to congratulate One Ocean Expeditions and your team onboard for another superb adventure. This was my second voyage with One Ocean Expeditions and I guarantee it will not be my last! Please pass on my thanks to your onboard team with a special mention to my kayaking guides who really did make my trip special. There were also several people onboard that I have stayed in touch with since my trip to Antarctica in 2014 and it was great to see them all again and it’s because of these people and the new team members that I spent time with that will keep me coming back! Congratulations again and see you on your Northwest Passage expedition/voyage very soon! 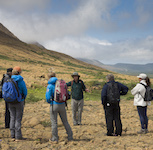 “We had a great time and a wonderful experience throughout the trip. 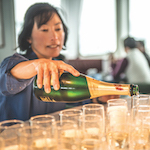 The crew was extremely friendly and truly displayed professionalism and care during the trip – something that is important on a 10 day voyage with less than 100 people in total. Food was phenomenal and plentiful…for a time that is all we did was eat. I can go on and on with what we enjoyed about the trip…I believe we made life-long friends on the ship”. It’s so good to hear from you! As you know, Antarctica is, was, and always will be magical. It’s been two months since we’re returned from the white continent, and not a day goes by that we don’t think about it. The wildlife. The scenery. The incredible crew and passengers aboard the Vavilov. Oh, and the incredible Shackleton Suite! We’ve traveled the world, and now when people ask us what our favorite place has been, we can unequivocally answer: Antarctica. All of our friends at home have loved hearing about our trip — we feel like explorers who have just returned from an adventure to “the New World!” I think I’ve even inspired one of my co-workers to take a trip down there for her sister’s birthday. And hopefully, I’ll convince my husband to go to the Arctic next. A girl can dream! Thank you so much. 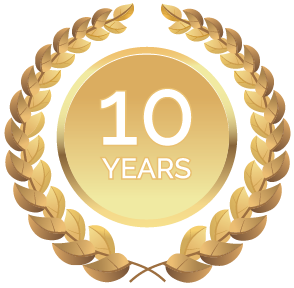 You helped us achieve a life-long dream. Looking for more information? Our agents have extensive experience and knowledge of the areas we visit. Speak with your travel agent or call our experts to learn more.